It is always a struggle to find a great hat pattern for the boys in my life. My husband and older sons are all so picky about their hats but I have managed to find a list of husband and teen boy approved hats that they will wear. I like to start making each one of them a hat or 2 in June and July so it’s ready when the unexpected cold or windy days happen. I also tend to get really busy with orders starting in September and October and then my own children and husband end up hatless. It’s very sad when your mom crochets for a living and you don’t have a hat 😉 So get a head start on your cold weather hats with this great list. One thing that I love about Jennifer’s patterns is that she includes sizes from newborn to large adult. This hat looks great on boys of all ages. 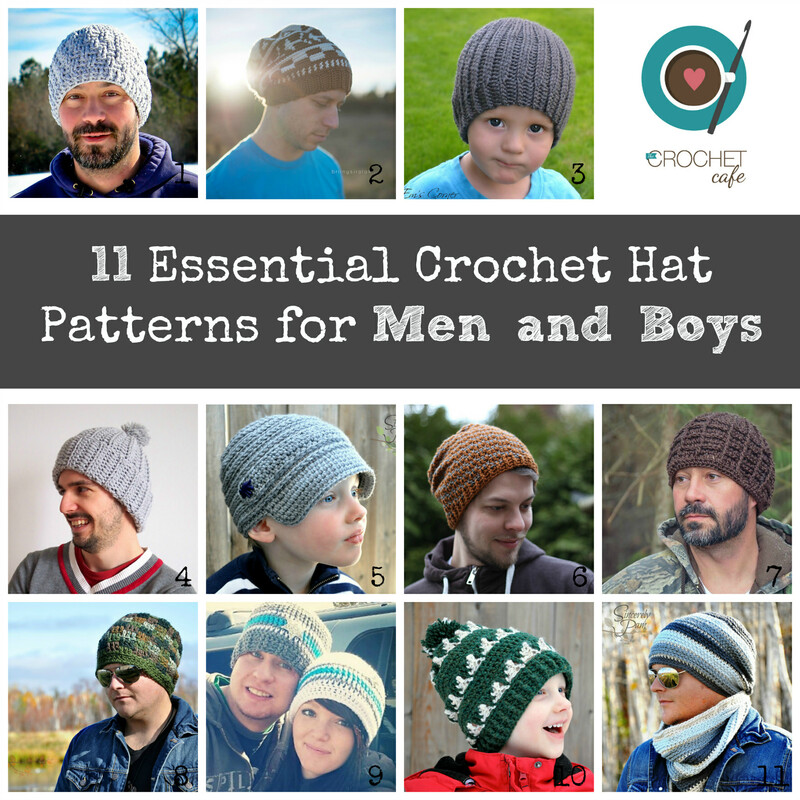 It is great for boyfriends and husbands but it is also on my go-to list of baby boy hat patterns. You can make this slouch in 2 colors or many colors! I personally have mine planned out for lots of colors but I’m making my son’s hat in 2 neutrals. I love it both ways. This pattern should be in everyone’s Ravelry library. Jennifer from A Crocheted Simplicity has a fabulous line of “Knit-Like” patterns. This is the perfect one for all the boys in your life. It is comfortable, soft, and stretchy. My little boy loves his. This hat can be worn as a slouchy or as a beanie with the brim folded up. Pom-pom or no pom-pom. Options are great! Here is a new pattern from Pam, a timeless newsboy with a textured hat body. This pattern is so much easier than it looks. It uses simple stitches but the stitch composition produces a really cool zig-zag design. Great for little boys and big boys, you can make this hat in a neutral color and it will go with everything. The Griffin Hat is made with bulky yarn or 2 strands of worsted weight held together so it is for those really cold days. Heidi shares a great FREE pattern for coordinating hats, one is slouchy, one is a beanie. I think this pattern would work great in team colors for all the fall football games. Something about the Jasper Beanie makes me want to have a snow-day. It looks so warm. I’m trying to decide which colors I should use for my 2 year old’s hat. Quick to work up, and very customizable, this is the perfect hat for a man. He can choose his stripe colors and there are even matching accessories in Pam’s shop. What patterns are you planning for the men in your life? I love this round up! I hope you don’t mind I featured your post on my blog. Please feel free to check it out and shoot me an email if it’s not okay, thanks!